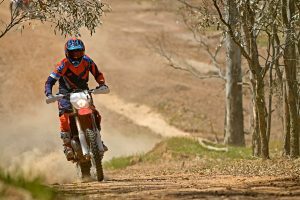 MotoOnline.com.au tests the 2018 Gas Gas EC and XC 300 models. 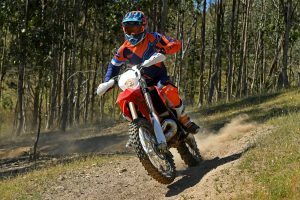 From the ground up the latest Gas Gas enduro entry is new, boasting a fresh frame, new suspension and engine, plus a generous nine percent overall weight reduction over the previous offering from the Spanish manufacturer. 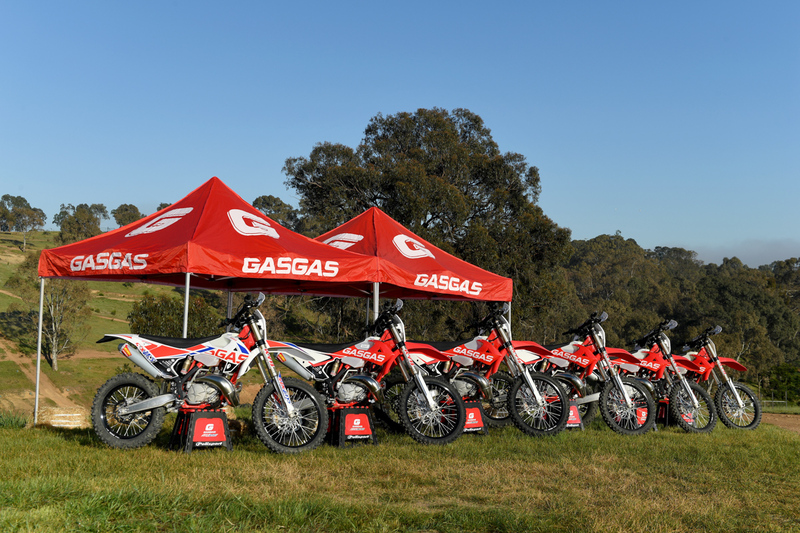 MotoOnline.com.au was recently on hand for the official launch of the 2018 Gas Gas EC and XC 300 model at Broadford in Victoria, where we were able experience the new models. 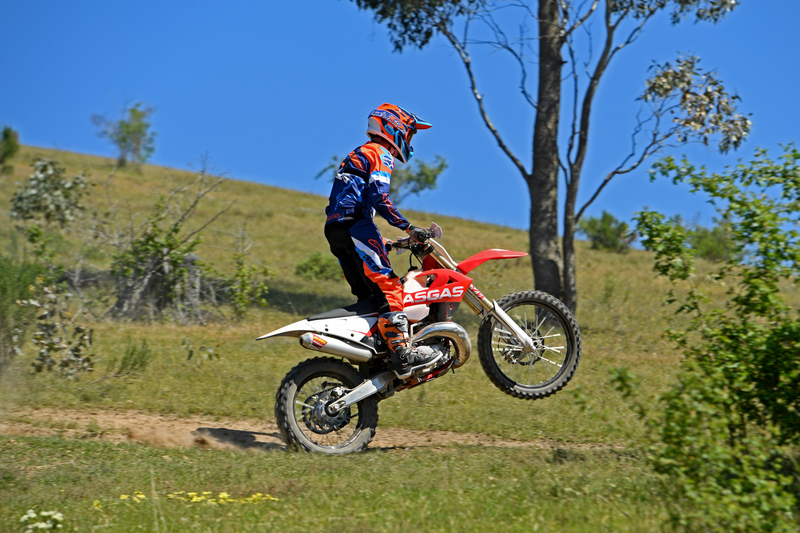 Lets start with the primary basis of the bike, being the chassis. 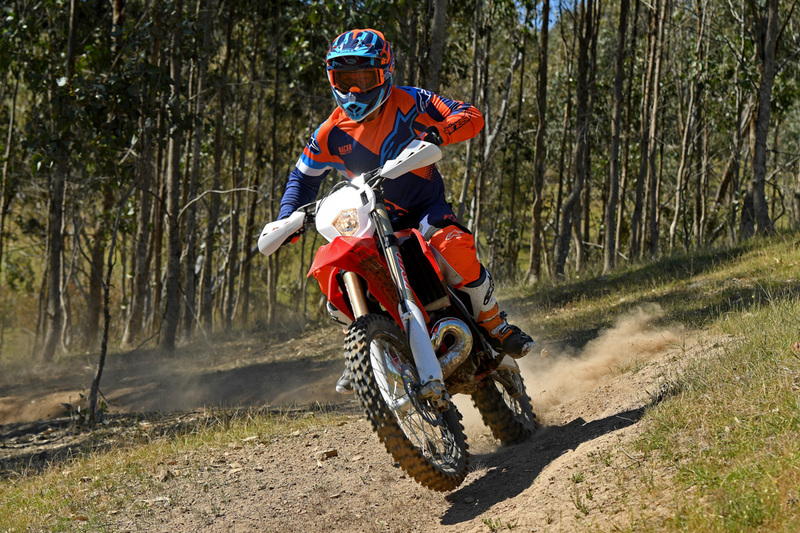 The previous version was a perimeter frame, which has been thrown out the window, as Gas Gas has replaced it with a central back-bone chromoly steel frame. 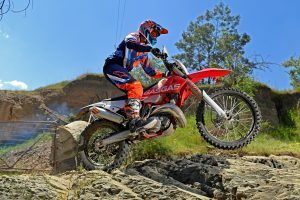 Using this new frame, the weight has been moved slightly for mass centralisation, while also seeing 20 percent drop in weight, maintaining improved torsional stiffness for better overall handling of the bike. 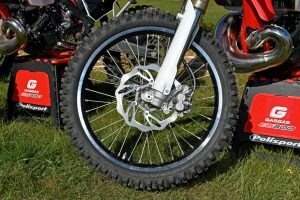 The swing arm has had some changes as well, built in axle and chain adjuster allows the wheel to be removed a lot easier than the previous setup with only need for a single tool. 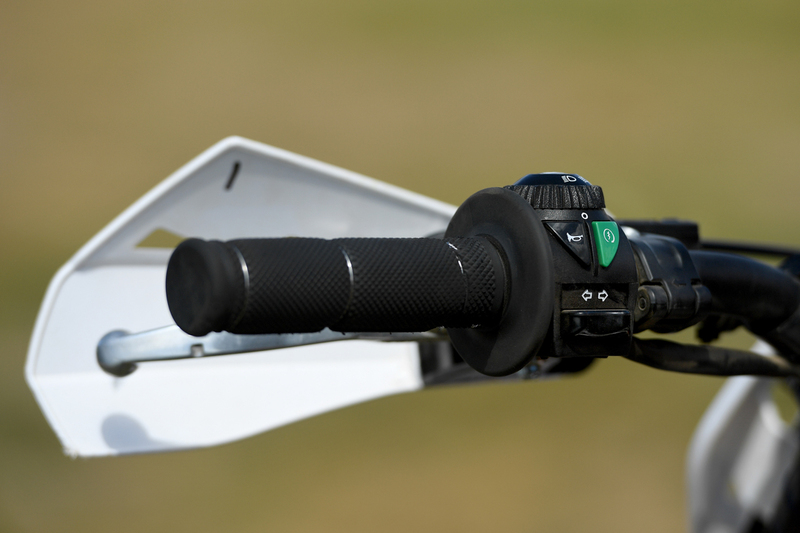 The chain tensioner system has also been revised from the previous version and is more similar other brands. The redesign of the swing arm also saves weight by seven percent over the previous version. 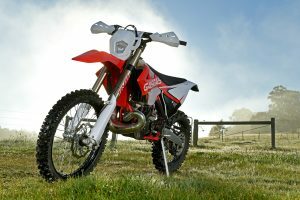 Naturally with a change in frame, the sub-frame is also significantly different with 15 percent weight reduction, made from aluminium and designed for ease of air-filter access and serviceability. 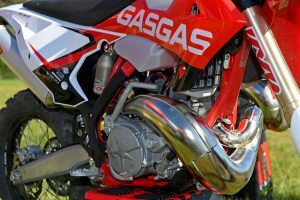 Switching the sub-frame has allowed for increased volume in the air-box, resulting in two benefits as the Twin Air filter is now able to be accessed and changed without tools and the increased volume allows for better air flow, increasing engine performance. 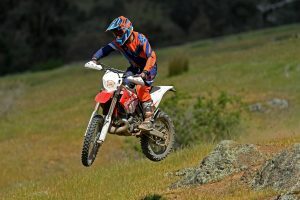 The wiring and battery are now separated from the bottom of the seat and are housed essentially in the same location, but sit on top of the air-box and are not attached to the bottom of the seat, making it a little less cumbersome when removing the seat from the bike. 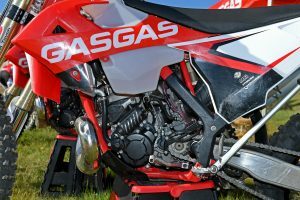 Moving to the front of the frame, Gas Gas has increased the fuel tank from nine litres to 10, using a translucent tank that not only looks trick, but is perfect for seeing exactly how much fuel you have left. The tank itself, although larger in capacity, is actually slimmer. The Gas Gas bodywork is all-new as well. The radiator shrouds don’t actually have stickers like previous years and have the graphics printed into the plastics, which is perfect for wear and tear, especially with knee guards or braces. 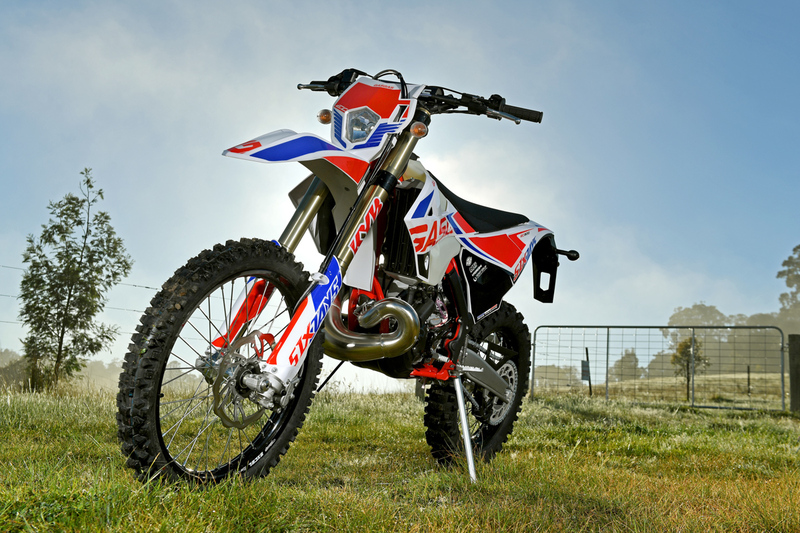 The overall look of the bikes plastics are modern, aggressive, clean and minimalistic looking. 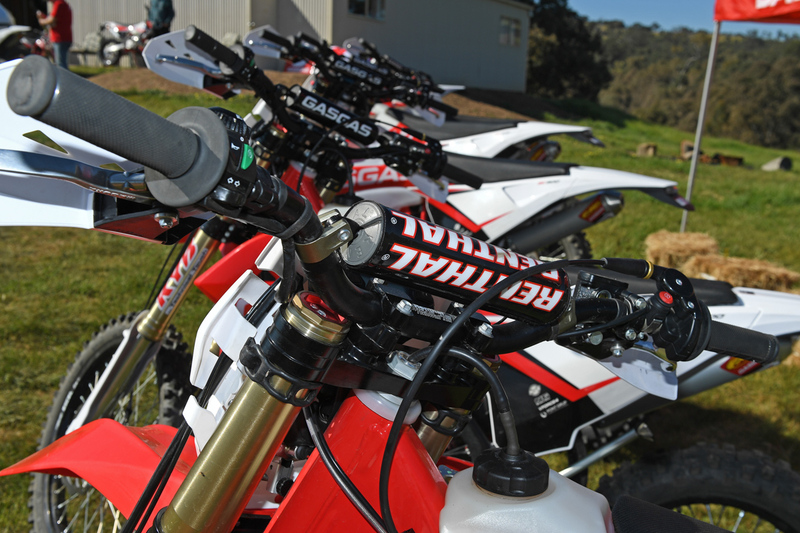 Also noted are the frame guards which help keep things clean and neat over the life of the bike. 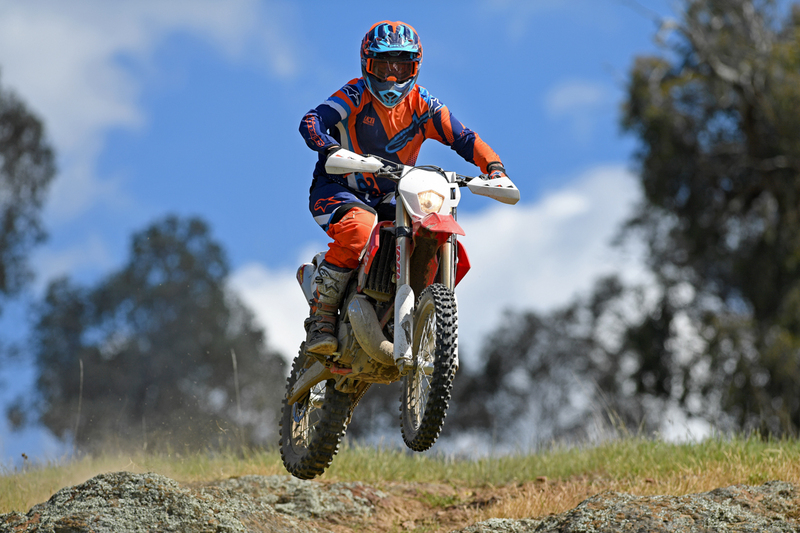 Gas Gas has added foam to the seat for better comfort, covered with a pyramid style gripper seat cover to keep you planted on the seat even in muddy conditions. 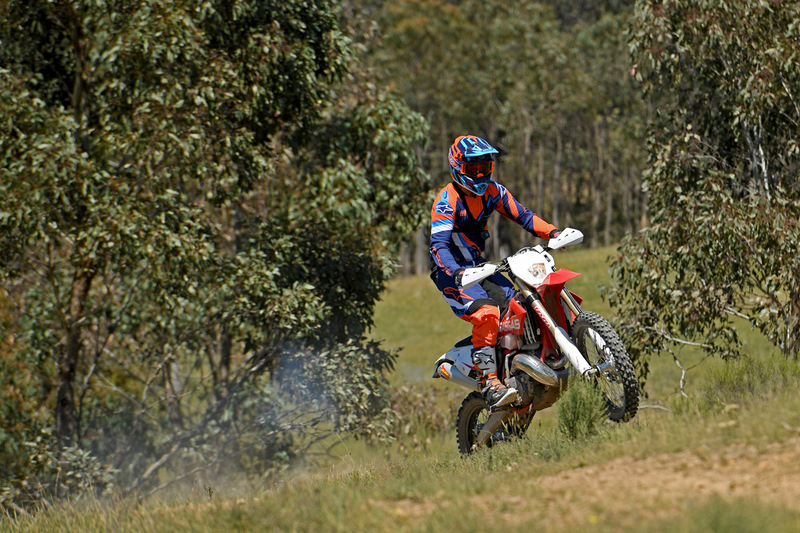 A plastic skid plate also comes as standard. For 2018, Gas Gas has switched to Kayaba (KYB) suspension front and rear – the same fork and shock that Yamahas have been running for years and have had great success with. The settings are not exactly what you would get on another brand, but developed specifically for Gas Gas. 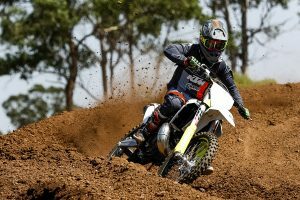 Like you would expect from the KYB suspension, it’s tried and trusted, so you really feel like the suspension is working well and balanced. We didn’t have any real gnarly sections of track, although there were several sections of the trail that lent itself to pushing your luck with how the suspension would react dropping off small ledges and harsh transitions, which the suspension and bike handled fine without blowing through all of the suspension or any deflection. 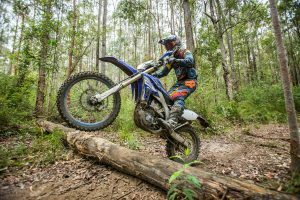 Through the tighter parts of the trail, the suspension really worked well with the geometry set-up of the bike – it really turned well in the tighter switch backs and off-camber turns. 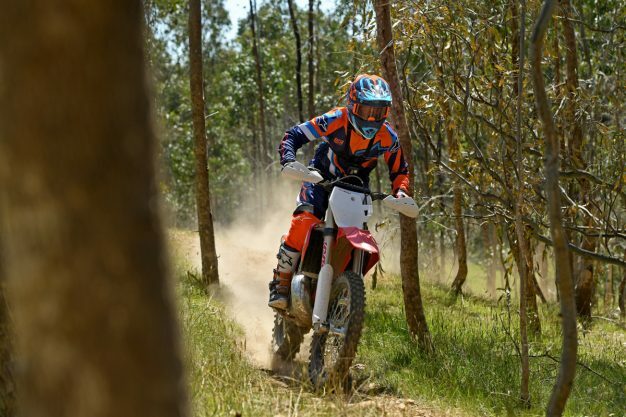 The front of the bike really felt like you could point it in the direction you wanted, without fighting it much at all. 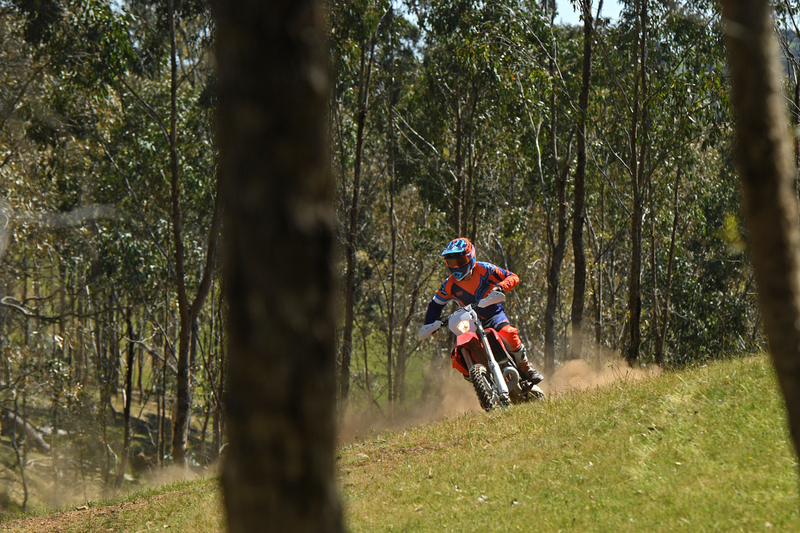 Needless to say, on the other parts of the trail the set-up felt very well-planted. 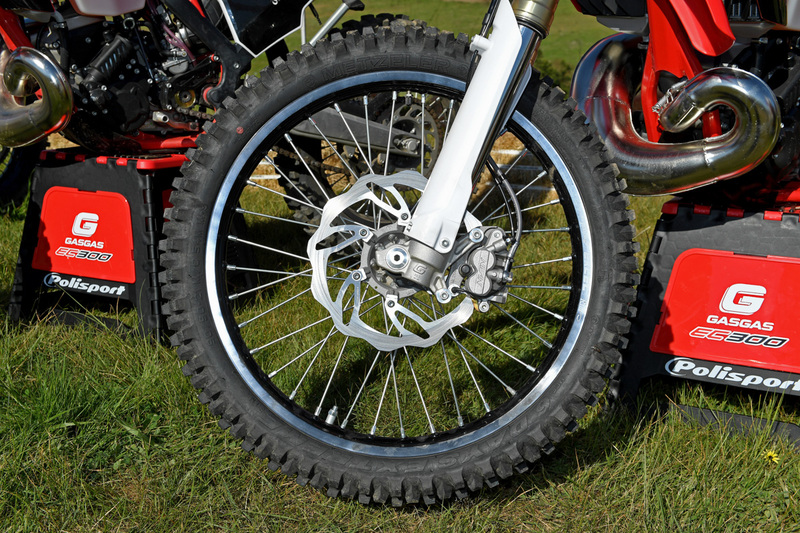 Metzler Six Days tyres come as standard, while the wheels are billet hubs on black Excel rims, which are again, well known and reliable. Gas Gas has chosen to use Nissin brakes front and rear for 2018, which have a great feel and immense stopping power with a NG 260mm front disc and a NG 220mm rear disc. 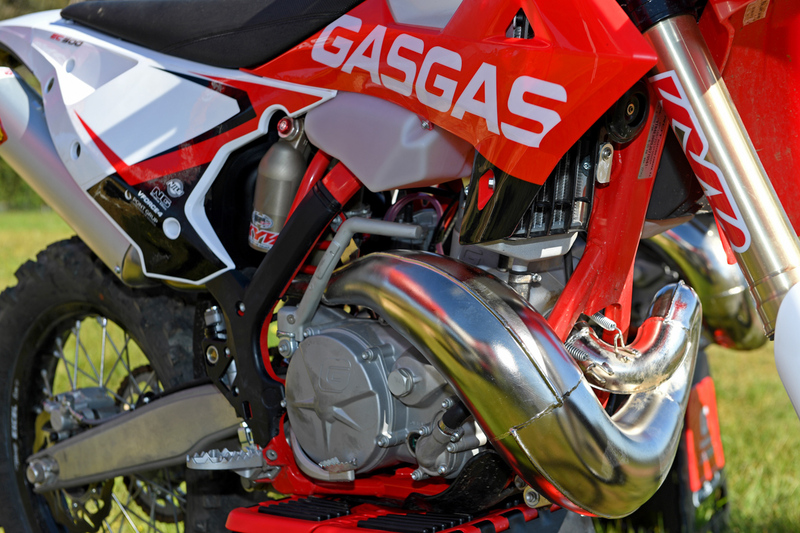 Probably the most notable and impressive move forward for Gas Gas is the increase in power by almost 10 horsepower! That is significant in comparison and nudging on 55hp is no joke for a 300cc two-stroke. Everything has been revised within the new engine, including a new crankshaft and cylinder-head. 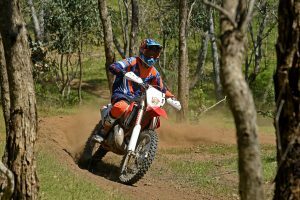 The intake features a new inlet nozzle and Keihin PWK 38 carburetor, which has been very successful on other Japanese-produced bikes, while a V-Force 4 reed block has increased the bottom-end and given a stronger mid-range power. 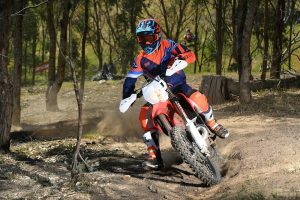 It has a six-speed transmission and the clutch has been improved for better lubrication and overall performance, which is actuated by a Magura hydraulic clutch. 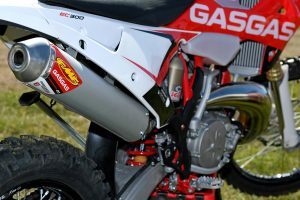 Featured is a new exhaust system with an FMF Powercore 2.1 silencer, while noted was the FMF exhaust on the Six Days model, as well as the XC variant. 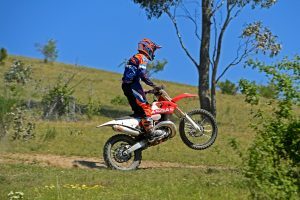 Updated radiators are now larger and fitted with a new filling cap location, plus the radiator grilles have been improved for better air flow. The 300 EC has plenty of power and could be lugged really easily in the tighter sections of the trail, while it builds speed in a hurry on the open parts of the trail. 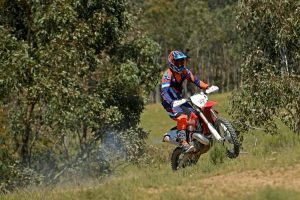 The suspension handles like you would expect from a major player in the big bore two-stroke world, with predictable feel and well-rounded performance front and rear. Ergonomically I found the bike really comfortable and the slight flare behind the knees (which isn’t that noticeable to look at) really did make it easier to grip. 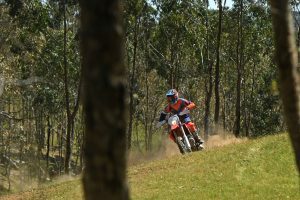 Otherwise, the bike does feel neutral and comfortable, which is always a positive aspect when it comes to long enduro stints. 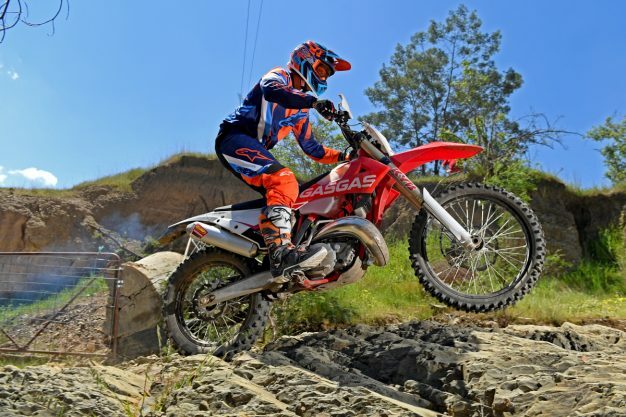 Firing the Gas Gas into life is more traditional compared to what has been the trend of late with both a kick-starter and an electric option standard on the 300. 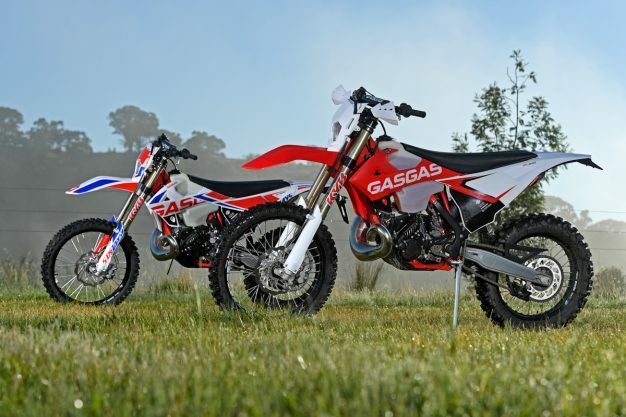 The Gas Gas EC 300 comes standard and set-up ready to ride compliant to the Euro 4 emissions, however at the time of purchase the dealer will have the bike ready for either road use (complying with the Euro 4 standards) or purely for off-road use, which does not need to comply. One of the other things that will stand out from previous models and other brands is that the electric start button is on the left-hand side of the bars, rather than the right. I almost got used to it by the end of the day and this is a new standard also for conforming to the Euro 4 regulations. 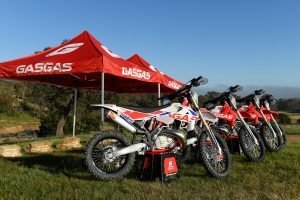 Overall the Gas Gas EC/XC 300 is a huge step forward for the Spanish manufacturer and it’s easy to see why they are so excited about it, now distributed locally by Urban Moto Imports. In simple terms, the EC 300 really does stand out as a true contender in the big bore two-stroke range. 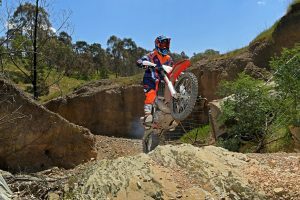 The overall package is great and a seriously legit option for someone who wants something different to their mates that’s not orange or white. 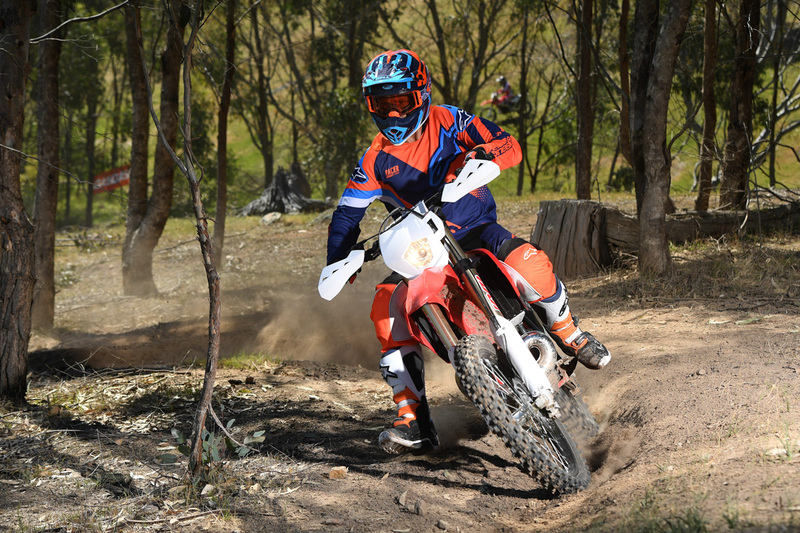 Weighing in at 105kg, it’s well within the ballpark now and considering the meaty power that is on tap right the way through the rev range, you have to be impressed. The 300 EC and XC are identical bikes apart from a couple of noticeable differences, since the XC is designed not to be road registered and is the cross country version. 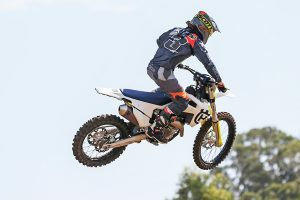 Not only does it not have a head light and wiring associated with that, but it also has an FMF exhaust over the EC model, which has a standard Gas Gas-produced exhaust. 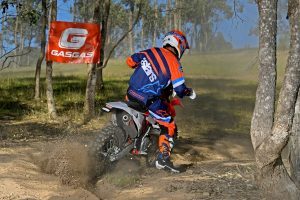 The 2018 Gas Gas EC 300 comes in at a recommended retail price of $12,290, while the Six Days 300 is priced at $12,490. 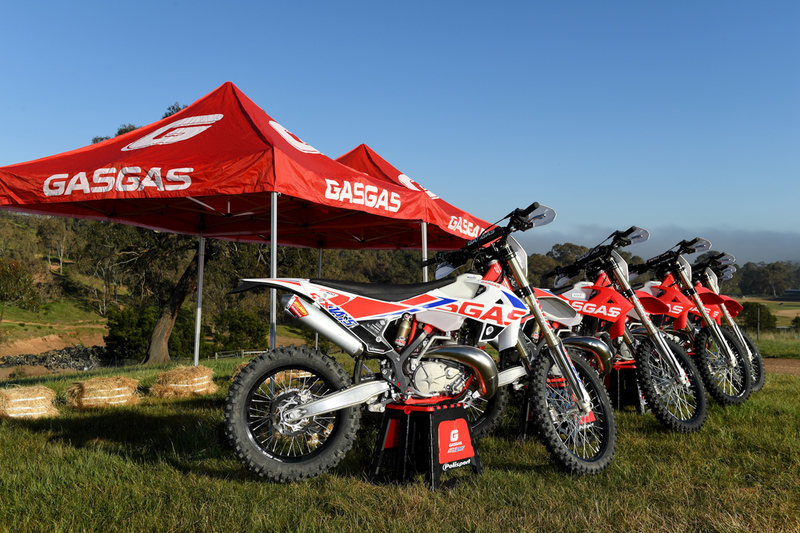 For the the Gas Gas XC 300, your looking at an RRP of $11,790, which are all now available at dealerships across the country. 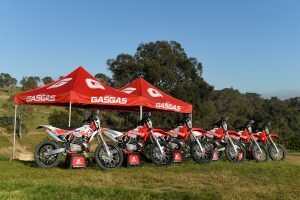 Visit www.gasgasmotorcycles.com.au for more information.